This article argues that debates over the legal status of bodies reveal a much deeper dispute over the nature of the self. In these discussions lawyers and ethicists have much to learn from a more profound understanding of the biological nature of the body. Far from being a static entity, the body is constantly recreating itself. It contains parts that are organisms in their own right. Bodies are dependent upon other bodies and the external environment for survival. The complex biological picture reflects a philosophical truth that bodies are interdependent and “leaky”. We should not, therefore, expect a single legal regime, such as property, to capture the biological and ethical values that are at stake in relation to every part of the body. A more complex statutory regime is required to recognise the complexity of the interests in, and nature of, different body parts. This article presents the case for taking a property approach in regulating the use of human bodily material. It examines the current debates on the issue and outlines the various perspectives, ranging from the anti-property stance, through the spectrum of positions on modified and semi-proprietary approaches, through to the “full-blooded” property approach advocated by some commentators. It elucidates why those approaches that allow some proprietary aspects into regulation are to be preferred. This article examines the definitions of “property” offered by the majority of the High Court of Australia in the case of Yanner v Eaton (1999) 201 CLR 351, which involved a statute giving the Crown “property” in fauna. It argues that the majority judges in that case endorsed a flexible or “thin” conception of property that is consistent with recognition of property in “things” such as excised human tissue and in vitro human embryos, despite the many differences between such “things” and ordinary chattels. A similar flexible conception of property was also an important factor in the United Kingdom case of Yearworth v North Bristol NHS Trust  QB 1. Advances in medical science have redefined the use and worth of once useless human tissue. The Australian common law has not kept pace with these advances, perpetuating the “no property” rule in human tissue. This has led to a plethora of legal problems surrounding who owns human tissue. 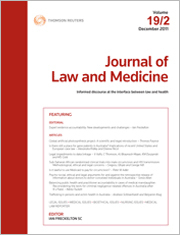 This article examines the Australian common law position in relation to regenerative tissue. It then compares it with approaches in the United States and the United Kingdom. With a focus on absurd or unethical outcomes in these jurisdictions, it illustrates how such situations will occur in Australia. Finally, it proposes a framework of property rights that could be adopted at common law to prevent these problems without the commodification of human tissue occurring. This article questions whether recognition of property rights in human tissue would enhance protection of the interests of donors of tissue used for research purposes. Best practice already obliges researchers to comply with a range of legal and ethical obligations, with particular focus on informed consent and research transparency. A number of lawsuits relating to research use of human tissue emphasise the central importance of informed consent to donors. Informed consent of communities, as well as individuals, becomes essential when engaging in research with indigenous peoples. Increasingly, genetic researchers are adopting participatory governance as a model for working with communities to develop culturally appropriate genetic studies that address health problems that are priorities for the communities involved. The transparency of the participatory governance model means that participants feel that their autonomy is respected and that their interests are being represented throughout the research process. The question of ownership of samples becomes irrelevant as control is codified through alternative mechanisms. There are multiple populations affected by issues associated with the excision and use of human tissue, each with different interests. There are also multiple subject matters for regulation; multiple regulatory goals that inform the system; and multiple strategies that may contribute to the attainment of those goals. This article outlines a range of regulatory mechanisms and suggests that a property regime is only one method of regulation in this area. Others may need to be considered to take account of the interests of all who may be affected. A criminal offence should be created in Australia for non-consensual genetic testing. This has been recommended in several law reform inquiries due to the sensitive and personal nature of genetic information, and the real potential for harm that non-consensual genetic testing can cause. Since those recommendations were made, the potential for misuse of genetic information has increased, with new methods to easily access large quantities of genetic material and information, such as whole genome sequencing and the increasing availability of direct-to-consumer genetic testing. Some countries have already created an offence of non-consensual genetic testing and their provisions are considered and compared. Tissue banks are critical to research efforts into the causes and treatment of many diseases. Biobanks are created from donated tissue but property concepts have not played a major role in understanding methods of the collection and use of tissue. Little work has been done to study the proprietary dimensions of these gifts primarily because of the influence of the res nullius rule. Instead, the primary focus of studies has been the concept of informed consent, but this has proven to be problematic. This article examines how the law of gifts can help to resolve these difficulties. It argues that the concept of conditional donation is a more useful way to understand and explain how tissue can be donated to biobanks. The article also suggests ways that conditional donation could be regulated so as to balance the needs of researchers and the concerns of donors. This article discusses property rights in recyclable artificial implants such as pacemakers. These implants can remain useful and valuable after the death of the first user, but it is not clear who owns the devices when they are removed. The article explains how property rights are transferred consensually and by the operation of law. It then applies these principles to the problem of recyclable implants and argues that the central question is whether the device in any given case accedes to its host human body. If it does not, then on removal the device is owned by the same person who owned it when it was first implanted: this may be the first user or their estate, or a hospital, or even a manufacturer. On the other hand, if the device does accede to the host body, then it ceases to exist as an independent object. The thing into which it has merged, a living human body, cannot be the subject of property rights. This means that any earlier rights in the implant are lost, and would not revive on removal. Instead, new property rights may attach to an explanted device. Forensic investigators have statutory powers to take DNA samples directly from suspects’ bodies in certain circumstances but sometimes the powers fall short, legally or practically. Police may then look for samples that have become separated from their suspects for one reason or another. No jurisdiction currently bars or even regulates this practice, which is instead loosely governed by laws on property, consent and evidence. This article argues that this lack of regulation undermines the entire system of forensic procedure laws. This article analyses some popular cultural representations of biotechnology, especially the artistic work of the Australian artist Patricia Piccinini to reflect on the role of law, technology and ethics in relation to bodily material. Her view that “with creation … comes an obligation to care for the result”, so evident in her poignant pictures, is a sober reminder to us of our responsibilities in regulating new technologies. This article examines the evolving patent term extension schemes under the Patents Act 1903 (Cth), the Patents Act 1952 (Cth) and the Patents Act 1990 (Cth). The analysis traces the change from “inadequate remuneration” to a scheme directed specifically at certain pharmaceuticals. An examination of the policy justification shows there are legitimate questions about the desirability of any extension. The article concludes that key information provisions in the Patents Act 1990 (Cth) that might assist a better policy analysis are presently not working and that any justification needs evidence demonstrating that the benefits of patent term extensions to the community as a whole outweigh the costs and that the objectives of extensions can only be achieved by restricting competition. As access to published materials becomes more readily available, the ability to plagiarise material, deliberately or unwittingly, has become easier than ever. This article explores important recent decisions in Australia and the United Kingdom regarding registered health practitioners who have engaged in plagiarism, both related and unrelated to their clinical practice, and explores the ways in which regulatory authorities in these countries have viewed scholarly misconduct committed by registered health professionals. This article also examines the implications of plagiarism for the registered health professions, and makes suggestions for strategies to reduce its influence and incidence in modern clinical practice. Travel for euthanasia or assisted suicide – so-called “death tourism” – is a controversial emerging subset of medical travel. Both anecdotal reports and research indicate that individuals from around the world, including Australians, are travelling abroad to source medications or procedures that hasten death. This article surveys the laws that govern these markets, and asks – using the Australian framework as a case study – whether current criminal laws are themselves facilitating, even driving, this new form of medical travel. It is suggested that the complex, uncertain and often problematic nature of provisions around assisting death in Australia is making euthanasia travel increasingly desirable for those wishing to end their lives. This article examines the regulation of impaired doctors in Australia and explores the inherent tensions in the new Health Practitioner Regulation National Law in attempting to both treat the doctor and protect the public. It discusses both informal and formal mechanisms of regulation with particular reference to therapeutic jurisprudence and mandatory notification. It focuses particularly on New South Wales and examines all the impairment cases which resulted in disciplinary proceedings in the Medical Tribunal of New South Wales in 2010. It identifies the most common forms of impairment and discusses the particular challenges that impaired doctors pose for regulators. In Japan, physicians are required to report unexpected health care-associated patient deaths to the police. Patients needing to be transferred to another institution often have complex medical problems. If a medical error occurs, it may be either at the final or the referring institution. Some fear that liability will fall on the final institution regardless of where the error occurred or that the referring facility may oppose such reporting, leading to a failure to report to police or to recommend an autopsy. Little is known about the actual opinions of physicians and risk managers in this regard. The authors sent standardised, self-administered questionnaires to all hospitals in Japan that participate in the national general residency program. Most physicians and risk managers in Japan indicated that they would report a patient’s death to the police where the patient has been transferred. Of those who indicated they would not report to the police, the majority still indicated they would recommend an autopsy. On 1 April 2009, 47-year-old London newspaper vendor Ian Tomlinson collapsed and died during the G20 protests in central London. The initial autopsy found death consistent with “natural causes”. However, that finding was disputed after the public release of mobile phone video footage showing a police officer striking and pushing Tomlinson to the ground. The release of this footage changed the course of events in the case: further post-mortem examinations found blunt force trauma to Tomlinson’s body; the Independent Police Complaints Commission launched a criminal investigation; and a coronial inquest opened that was presided over by public order policing expert Judge Peter Thornton QC. On 3 May 2011, a coronial jury delivered a verdict of “unlawful killing”, finding police actions against Tomlinson “excessive and unreasonable”. The Crown Prosecution Service then revised its decision not to prosecute the officer filmed striking and pushing Tomlinson, and on 19 July 2012 the officer was acquitted of manslaughter. This case highlights a number of key issues discussed in this article, including the symbolic and practical importance of open inquests in allaying suspicion and rumour; the ordeal of death investigation proceedings as obstacles to justice; and the seeming contra-indications for justice thrown up by divergent legal outcomes. In high-profile matters such as the Tomlinson case, these issues are further underscored by the “new publicity” around inquests in a multi-media digital age. Health information collected by governments can be a valuable resource for researchers seeking to improve diagnostics, treatments and public health outcomes. Responsible use requires close attention to privacy concerns and to the ethical acceptability of using personal health information without explicit consent. Less well appreciated are the legal and ethical issues that are implicated when privacy protection is extended to the point where the potential benefits to the public from research are lost. Balancing these issues is a delicate matter for data custodians. This article examines the legal, ethical and structural context in which data custodians make decisions about the release of data for research. It considers the impact of those decisions on individuals. While there is strong protection against risks to privacy and multiple avenues of redress, there is no redress where harms result from a failure to release data for research. For the pdf version of the table of contents, click here: WAU – JLM Vol 21 Pt 2 Contents.